A week after Rob Taylor (1985) bought Stafford’s Chocolates in Porterville, a man with sad eyes approached the shop’s counter. “He said, ‘this is the first year my daughter’s been away from home. She joined the military and is in Germany. 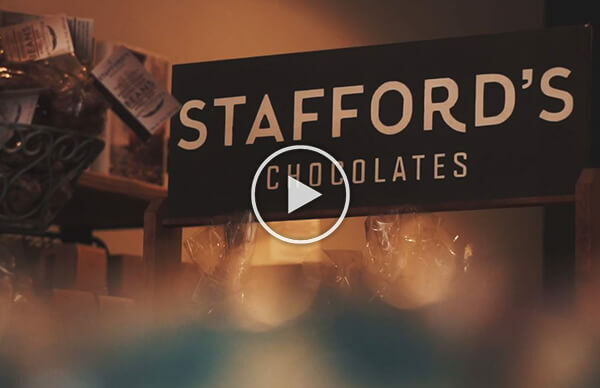 She called and said, Dad, I just want one thing — will you go down to Stafford’s and send a box of chocolate to me? I just want a taste of home.’ That exchange made me realize how important this little chocolate shop is to our community,” Taylor recounted. Ballis Glass sits in the heart of an industrial business maze just east of Fresno Yosemite International Airport. 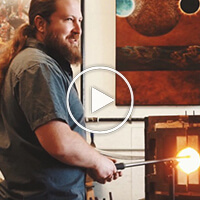 The over-sized workshop is home to numerous works of art, created at temperatures nearly as hot as lava. 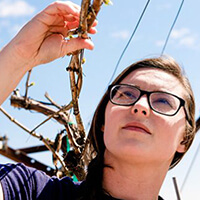 Fresno State’s vineyard technician, Leah Groves, oversees over 100 acres of vineyards across campus. Her job is to provide grapes and raisins for Fresno State products as well as other stores and wineries in the Central Valley. 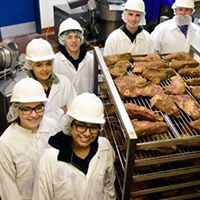 Six recent Fresno State graduates have started the Ag One Meat Science Laboratory Scholarship Endowment to support students who work in the unit and produce an array of popular meat products sold at the Rue and Gwen Gibson Farm Market. Robert “Bob” Cabral (1984) has launched Game of Throne Wines in Healdsburg, California. In 2011, while working at Williams Selyem, Cabral was honored with the Wine Star Award from the “Wine Enthusiast Magazine,” naming him as Winemaker of the Year. Diana Giraldo (2017) is now the Communications Manager for the Fresno Chamber of Commerce. Priscilla Rodriguez (2012) was promoted to Director of Food Safety at Western Agricultural Processors Association. She began her tenure at WAPA in July 2015. Greg Newman (1990) is the new Executive Director for the Clovis Chamber of Commerce. Newman’s duties include strengthening business relationships in the community, working with members and the board of directors as well as with Clovis Unified School District, Clovis Community College, the City of Clovis and other local organizations. Yvan Mendoza (2011, ’16) has been named an Associate Geologist with Provost & Pritchard Consulting Group.